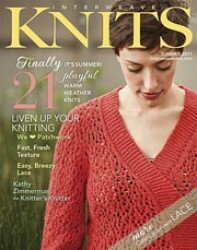 "Lace Goes Afield" investigates rustic, spirited lace textures; "Summer Twine" checks out summer-ready cables; "Cast on. Knit. Wear." presents three simple knits with intriguing twists; "Mixed Media" combines knitting technique and influences from across the fibre crafting world; and "Fine Lines" showcases in-the-detail texture. All in all - 21 knits ideal for the summer season!